The TS200 Modulated Power Supply is a unique instrument for many test and measurement applications such as LDO PSRR measurement, battery simulator, op amp CMRR measurement, function generator amplifier, transient response test, four-quadrant power supply, laboratory power amplifier, and more. 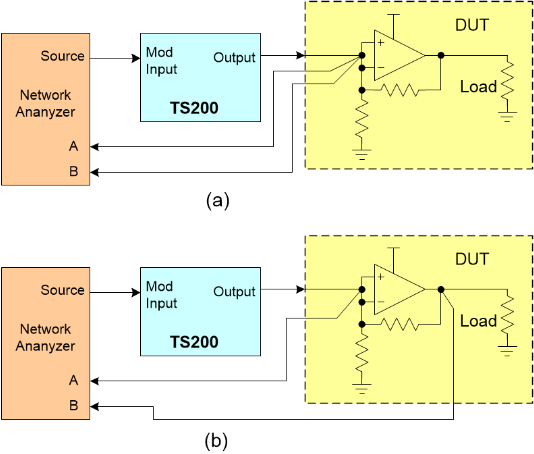 TS200 is also ideal as a high current amplifier for amplifying waveforms. It can drive high current or high power or high voltage load. The TS200 high voltage amplifier can output up to 70V. As a waveform amplifier, it accepts AC or DC input from a function generator and amplify the waveform by a factor of 10. TS200 is also great for pulse amplifier and laboratory power amplifier. TS200 modulated power supply can source or sink current. It can be used as a battery simulator. The TS200 has a variable DC output that can easily simulate battery voltage changes. Thus it is great for battery charger testing such as those in battery operated portable electronic systems. The TS200 Modulated Power Supply is perfect for many test and measurement applications such as waveform amplifier for function generators, battery simulator/emulator, amplifier and LDO PSRR measurement, Helmhlotz coil driver, op-amp CMRR test, high voltage driver for piezo transducers, voltage transient test, high brightness LED driver, laboratory amplifier, four-quadrant power supply, and more. TS200 is a four quadrant power supply, sometime referred to as bipolar power supply. It can output both positive and negative voltage and it can source and sink current up 4.0A. It is sometimes refer to bipolar operational amplifier. Power supply rejection ratio (PSRR) or some time called power supply ripple rejection measurement are often difficult to measure, especially when the device under test (DUT) is heavily loaded. Because most network analyzer cannot drive a heavy load, the TS200 modulated power supply is very useful for PSRR test for such devices as LDOs (low dropout regulators) and power amplifiers. PSRR measurement is easy with the aid of the TS200. Figure 2 shows how to measure PSRR. PSRR measurement technique involves a network analyzer, TS200 power amplifier, and device under test (DUT). The TS200 input signal is applied to the BNC connector on the front panel. The input is first conditioned by the selectable coupling. The TS200 input is either AC-coupled or DC-coupled. This allows added flexibility for the TS200 to work with a variety of instruments such network analyzers and function generators. Use the AC-coupled setting to blocks out any input DC voltage. Use the DC-couple setting to allow the source DC voltage to be amplified. The TS200 gain is fixed. The gain is either 0dB or 20dB. A-version of the TS200 modulation input gain is unity (non-inverted). The B-version of the TS200 modulation input is amplified by a factor of 10 or 20dB. When order the TS200, please specified the gain. The amplifier configuration is non-inverted. Figure 1 shows the TS200 Modulated Power Supply functional equivalent diagram. It consisted of an selectable AC-coupled or DC-coupled input, a high current amplifier, and a DC output offset. The adjustable DC offset sets the output DC voltage. This DC offset feature is ideal for LDO or amplifier PSRR measurement, because they require a DC voltage. The TS200 input impedance is 10kΩ. Figure 1. TS250 waveform amplifier functional equivalent diagram. The TS200 output is on a pair of banana binding posts. The output pair is labeled as “+” and “-”. The “+” terminal is the positive output while the “-” terminal is the negative output. In normal usages, OUTPUT negative terminal is connected to the common “Ground”. The OUTPUT is enabled by press the ON/OFF button. The LED light is on when the output is enabled. Press button again to turn off the output. The TS200 is protected by a number of fault protections. These fault protections are: output over-current, short circuit, thermal shutdown, and internal under voltage. If an over-current or short circuit fault is occurred, the output is disabled momentarily (about 1 second). Then the output is enable again. If over-current persisted, it will go into a repeated on and off patten. The TS200 features a DC OFFSET output. This feature is useful for waveforms that contained an AC waveform on top of a DC voltage such as PSRR, CMRR, and line transient tests. The OFFSET knob adjusts the DC voltage. For function generator amplifier, DC offset is generally set to zero. The TS200 features a large LCD voltage displays. The LCD display read the average value. For example, a sine-wave with no DC offset will read 0V. A 30% duty cycle 0-to-10V square-wave will read 3.0V. The TS200 accepts universal AC power input from 100VAC to 240VAC 50/60Hz. It comes with an America-style power cord. Adapter is needed (not included) for any other country outlet. Figure 2. LDO PSRR measurement setup. (a) Calibration setup, (b) PSRR setup. Figure 2 shows the LDO PSRR measurement setup. Using a network analyzer, the source is connected to the TS200 modulation input. The TS200 output is connected to the LDO supply input. It is recommended to reduce the LDO input capacitance to minimum. 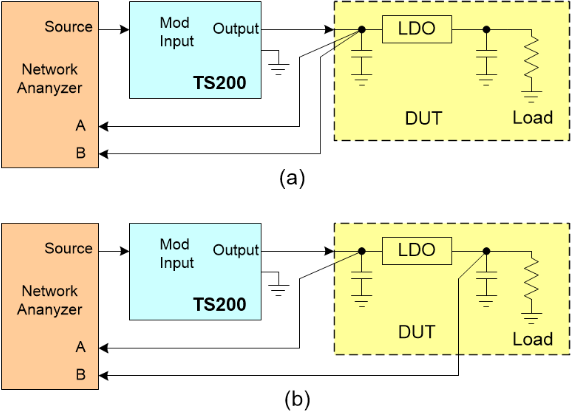 Since the TS200 can drive a heavy load, thus the LDO output can be loaded with the desired loading resistor (i.e. maximum specified load). Set the TS200 modulation input to AC-coupled. Adjust the DC Offset knob until the output DC voltage reaches the desired voltage (i.e. 3.3V). Typically for PSRR measurement, the supply ripple amplitude is 200mVpp. If you are using the A-version, set the network analyzer output to 200mA. If you are using the B-version and consider the modulation gain is 20dB, set the network analyzer output amplitude to 20mVpp. First the network analyzer and the TS200 need to be calibrated. Figure 2a shows the calibration setup. The network analyzer input-A and input-B are connected together at one point on the DUT board near the LDO supply input. Set the network analyzer to calibration mode and sweep over the frequency range (i.e. 100Hz to 100kHz) to be measured. Save the calibration data for later use. Refer the network analyzer manual for detailed calibration setup. After calibration, LDO PSRR measurement setup is shown Figure 2b. The network analyzer input-B is moved to the LDO output near the capacitor while keeping input-A at the LDO input. Again sweep the network analyzer over the desired frequency range. You may refer to the network analyzer manual for details. After subtracting the calibration data, PSRR data is plotted. Figure 3 shows an example of PSRR plot. Table 1 shows a list of network analyzers can be used with the TS200. Table 1. List of network analyzers for PSRR testing. Figure 3. Example of PSRR plot. Alternatively, PSRR test can be done using an oscilloscope. Place the oscilloscope probes as shown in Figure 4. CH1 probe is connected to LDO supply input near the capacitor and CH2 probe is connected to LDO output near the capacitor. 1x probe is recommended due high oscilloscope noise floor. Connect a function generator to the TS200 Modulation input. Set the function generator output to 200mVpp sinewave or 20mV if B-version is used. Set the frequency to the frequency of interest (i.e. 1kHz). Then set the TS200 modulation to AC-couple. Adjust the DC Offset knob until the TS200 output voltage reaches the desired voltage (i.e. 3.3V). Figure 4. PSRR measurement using an oscilloscope. Using the oscilloscope, one can measure the amplitude voltage at CH1 and CH2. Divide CH2 by CH1 is the PSRR. One can use the below equation for PSRR calculation in dB. If PSRR is better than 40dB, it is recommended to increase the TS200 output ripple voltage 500mVpp due to oscilloscope has lower sensitivity than network analyzer. The TS200 is also ideal for amplifier power supply rejection ratio measurements, especially power amps operating at maximum load conditions. Such amplifiers as audio amplifiers (class-A, B, AB, D and G) with heavy loading are ideal for TS200. 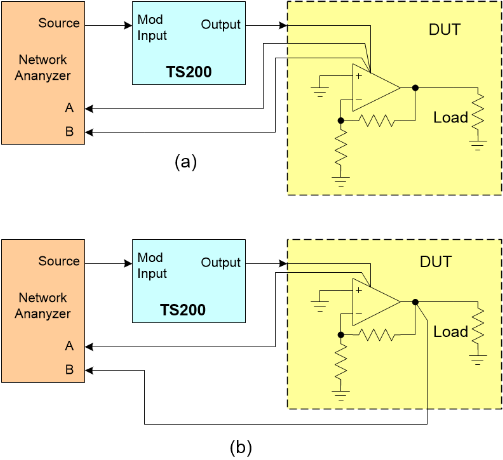 TS200 can also measure PSRR for op-amps, differential amplifiers, unity gain buffers, digital-to-analog converters, and analog-to-digital converters, etc. Op amp PSRR measurement is same as LDO except for a few minor differences. 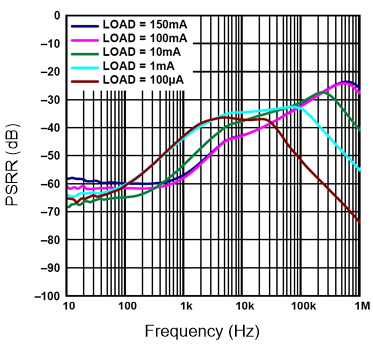 Please see Figure 5 and refer to the previous section, "LDO PSRR Measurement", for amplifier PSRR measurement. Figure 5. PSRR measurement setup for amplifier. (a) Calibration setup, (b) PSRR setup. As shown in Figure 5, the amplifier input is grounded, either AC or DC ground, for PSRR measurement. Calibrate the setup as shown in Figure 5a with the network analyzer input-A and input-B connected to the same point at the amplifier's supply input. After calibration, move input-B to the amplifier output as shown in Figure 5b. Then measure PSRR in the same way as LDO in the previous section. 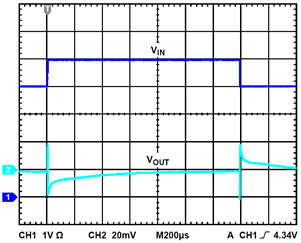 Amplifier common-mode rejection ratio or CMRR can be measure with TS200. Figure 6 shows how to measure CMRR. CMRR measurement for amplifiers is same as PSRR except for a few minor differences. Figure 6. CMRR measurement setup for amplifier. (a) Calibration setup, (b) CMRR setup. As shown in Figure 6, the amplifier's positive and negative inputs are connected together and connected to the TS200's output. Using a network analyzer, the source is connected to the TS200 modulation input. Set the TS200 modulation input to AC-coupled. Adjust the DC Offset knob until the output DC voltage reaches the desired common-mode voltage (i.e. ½ VCC). Typically for CMRR measurement, the supply ripple amplitude is 200mVpp. First the network analyzer and the TS200 need to be calibrated. Figure 6a shows the calibration setup. The network analyzer input-A and input-B are connected together at one point on the DUT board near the amplifier input. Set the network analyzer to calibration mode and sweep over the frequency range (i.e. 100Hz to 100kHz) to be measured. Save the calibration data for later use. Refer the network analyzer manual for detailed calibration setup. After calibration, amplifier CMRR measurement setup is shown Figure 6b. The network analyzer input-B is moved to the amplifier output while keeping input-A at the input. Again sweep the network analyzer over the desired frequency range. You may refer to the network analyzer manual for details. The TS200 is also ideal for amplifying waveforms for driving high-voltage or high current or both. It is ideal for amplifying function generator output to drive heavy load. TS200 is acting as laboratory power amplifier. Figure 7 shows the TS200 connection as a high voltage or power amplifier. The function generator or arbitrary waveform generator (AWG) output is connected the TS200 modulation input. Typically, the TS200 DC Offset or DC output voltage is set to zero and input modulation is set to DC-couple. If the B-version of the TS200 is used, the gain is 20dB. Since the function generator's output voltage is amplified by a factor of 10. If the TS200 is set to DC-couple, both the DC voltage and AC signal are amplified by a factor of 10. If TS200 is set to AC-couple, only AC signal is amplified. The TS200 DC output is set by its DC Offset knob. Most LDOs and switch-mode power supply (MSPS) specified their line transient specifications. Line transient response specifies its output voltage change after an input voltage step change. For example, an LDO specified its output voltage deviates less than 5mV for a 200mV input voltage step from 3.6V to 3.8V in 10us. This is also called line step response. Figure 8 shows how to measure line transient test. A function generator generates a square pulse with a specific rise and fall time (i.e. 10us). The function generator is connected to the input of TS200 and the TS200 output is connected to the device under test. Typically the TS200 is set to DC-couple. Set the function generator's pulse high and low voltages generate the transient step. For example, to generate a 3.6V to 3.8V voltage step, set the function generator output voltage low to 3.6V and output high voltage to 3.8V. If B-version is used, set output voltage low to 0.36V and output high voltage to 0.38V, since the TS200 gain is 20dB. For transient measurement it is recommended to keep the DUT input capacitor to minimum (0.1uF or less) to allow faster rise and fall time. Use as short cables as possible (Less than 12 inches) connecting TS200 output and the DUT. Twist the cables to together to minimize inductance. To measure the line transient step, connect an oscilloscope probe (CH1) to the DUT input and another probe (CH2) to the DUT output as shown in Figure 8. The transient response is measured at CH2. Figure 9 shows an example of line transient measurement. Figure 8. Line transient test setup. Figure 9. Line transient measurement example. In some applications, the device under test may be sensitive to power supply noise. For example, VCO (voltage controlled oscillator) phase noise may be degraded with excessive supply noise. TS200 can be use to aid supply noise sensitive circuit testing. Figure 10 shows a supply noise simulation setup. The function generator is set to noise output. The function generator output is connected to TS200 Mod input. The input is set to AC-couple. Adjust the DC Offset knob until the TS200 output voltage reaches the desired DUT supply voltage level. Adjust the noise level on the function generator to see how the DUT is responded to supply noise. Figure 10. Power supply noise simulator. The TS200 can be use as a four-quadrant power supply or a batter simulator. Four-quadrant power supply can output positive or negative (see voltage range option) voltage and can sink or source current. The TS200 can act as a battery emulator as well. It can output a positive voltage and can sink or source current - just like a real battery. The TS200 is useful for testing battery chargers. To use the TS200 as a four-quadrant power supply or battery simulator, leave the Mod Input unconnected. Adjust the DC Offset knob until the TS200 output voltage reaches the desired supply voltage. The TS200 can source as well as sink current.